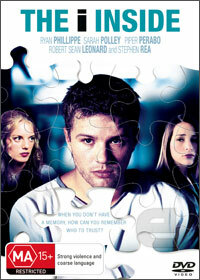 This 2003 movie starring Ryan Phillippe, Sarah Pollery and Piper Perabo finally arrives on DVD in this modern science fiction thriller about a man who has the power to change time after a deadly car accident. The movie itself is based on Michael Cooney's play Point of Death, which begins with Simon Cable (Phillippe) waking up in a hospital bed with no recollection of the past two years of life. To compound the situation, he discovers that his wife Anna (Piper Perabo) is blackmailing him and to make things even more complicated, a mysterious woman walks his dreams. From there, Cable must attempt to piece his life together, piece by piece as he travels between timelines. The movie is extremely reminiscent of the Butterfly Effect as Cable has the power to change the past that does not always lead to success. The movie has elements of science fiction, drama and a healthy dose of the thriller genre, however director Roland Suso Ritcher seems to become lost in this complex tale about a man who may or may not be sane. Although the i Inside is an interesting science fiction thriller, the parallels between The Butterfly effect seem a little too strong, even though this movie predates it. Needless to say, The i Inside is definitely a thinking man's science fiction thriller!